Visit your GP, who will refer you for ‘booking bloods’ and a dating scan and/or a first trimester screening test (a risk assessment test for Down syndrome and other chromosomal abnormalities (trisomy 13 &18). Get referred to a GP obstetrician or a specialist obstetrician. Either can determine your suitability for a midwives clinic. 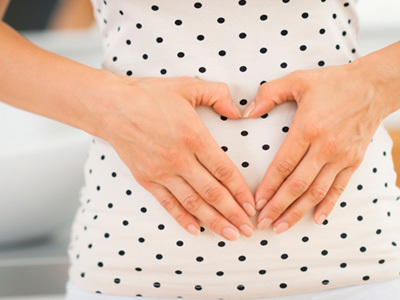 Continue using your pregnancy multivitamins during the first trimester, particularly folic acid. Morning sickness is a common symptom and can be managed with simple dietary adjustments. Sometimes blood tests and medication are necessary. Your GP can help you with this. If you have a medical condition for which you use medication you ideally check with your GP or specialist before your pregnancy whether your medication can be used in pregnancy and if not, to be changed to medication that is safe in pregnancy. (www.mothersafe.org.au ). Don’t stop your medication without consulting a doctor. The ‘What to Expect’ app can give you a week-by-week overview of your baby’s development. You will start to feel a lot better (if you were experiencing morning sickness particularly as this usually resolves at 12-16 weeks) and have more energy. Your doctor or midwife will give you a referral for a 20 week scan (morphology scan) which is a detailed scan of the organs of the baby, your placenta etc and you can find out the gender of the baby. You will need a booking–in appointment with the hospital, the phone number is on the back of your antenatal card. At 26-28 weeks a diabetes test (blood test) will be arranged together with additional blood tests. If you have a negative blood type you will require an anti-D injection to prevent you from forming potentially harmful antibodies. This will be repeated at 34 weeks. Exercise is a great way to keep fit! We recommend 30 mins of low impact exercise a day (walking, swimming, pilates, yoga). Manage your weight well. There is no need to eat for two, and a healthy weight gain can reduce your risk of complications later in your pregnancy. Also eating healthy during your pregnancy will set your baby up for a healthier life. You will start to become a lot more uncomfortable with the baby growing bigger. It is still a good idea to continue to exercise gently and consider joining a ‘fit for birth’ class. Antenatal classes are a very good idea and will give you useful information about what to expect in hospital, whilst having your baby and what to expect when breastfeeding (or bottle feeding). A boostrix vaccination is recommended in the third trimester to build up antibodies against whooping cough. This way your newborn baby is best protected. Your partner and close family ideally should also receive a booster vaccination if they haven’t had one in the past 5 years. The frequency of your antenatal visits will increase and go to weekly visits from 37 weeks onwards. You will be tested for GBS at 36 weeks, which is a bacteria that can infect the baby during a vaginal delivery and cause sepsis in the baby. A normal pregnancy duration is anywhere between 37-41 1/2 weeks. We generally recommend induction of labour for ‘postdates’ at around 10 days after your due date, unless you develop complications earlier that make it necessary to deliver your baby earlier. The websites listed below provide valuable information about pregnancy and if they raise any questions, please contact us.